Don’t let Pandemic II’s overly simple visuals fool you. Behind the plain graphics and simple interface is a nice strategy game with a very morbid theme. You are tasked to wipe out the entire human race by unleashing deadly viruses, pathogens and bacteria via different carriers (rodents, insects, contaminated water etc.). If you find this quite sinister, then there’s more to it than just deploying pathogens. You get to choose symptoms to ensure disease-causing viruses spread rapidly while keeping the virus visibility low to prevent fictional disease control centers from containing the virus outbreak. Pandemic II adds more variety to the original game, giving plenty of ways to evolve bacteria and parasites and spread diseases via symptoms and carriers. The game slider lets you change speed as some parasites take longer to evolve and spread. The in-game guide and tutorial will guide you through the game basics. 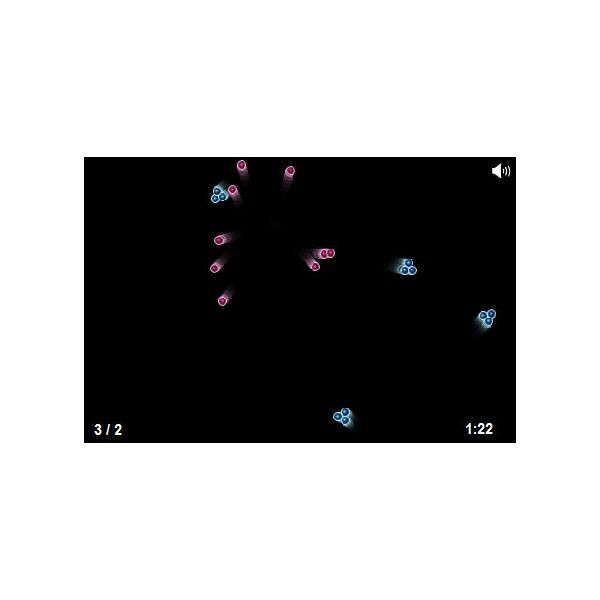 There are two levels of gameplay – Relaxed and Realistic – the latter allows parasites and bacteria to evolve and spread in real-time. You will have to unleash the right type of disease and choose the right symptoms and carriers to ensure the disease spreads far and wide. You will be updated with the latest news on virus spread and containment and have to take decisions according to the events that take place in real-time. I found the game very unusual, yet interesting as it has some level of strategy and is quite addictive. Dust is a unique physics-based game that simulates the way dust particles react when wind whisks them up in the air. You will have to click and drag your mouse cursor to spread dust particles on a black background and get a taste of the awesome physics-based gameplay. To make things more interesting, the game adds several variations, such as magma dust, fire dust, acid dust and uniquely animated dust particles. Mixing dust particles can lead to strange reactions in the virtual canvas. For example, putting “Fire” dust on the ground and sprinkling Nitro particles on top of them will guarantee some colorful fireworks. There are plenty of combos to achieve and each combo offers exciting twists. You can left click or right click to enhance the particle effect and create a beautiful design on the black canvas. The game requires the java plug-in, so make sure to update your PC with the latest add-ons before playing Dust. 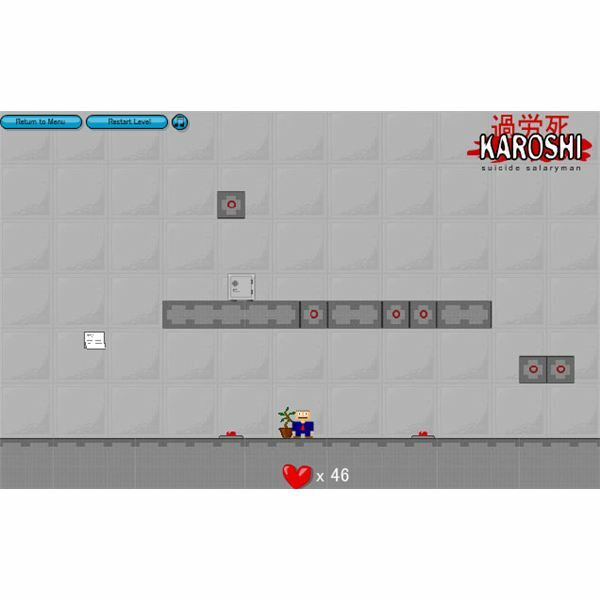 Karoshi Suicide’s counter-intuitive objectives allow you to do the unimaginable – get your character killed to advance through different levels instead of guiding him safely through obstacles. Each level throws in a new challenge through different puzzles, which need to be solved in order to kill your character. There are variety of levels and plenty of surprises, including a wacky boss mode. Karoshi’s dark humor may seem quite scary and depressing to some players. Maybe game developers wanted to highlight the plight of overworked employees (“Karoshi” means death from overwork) or created a game just for fun. 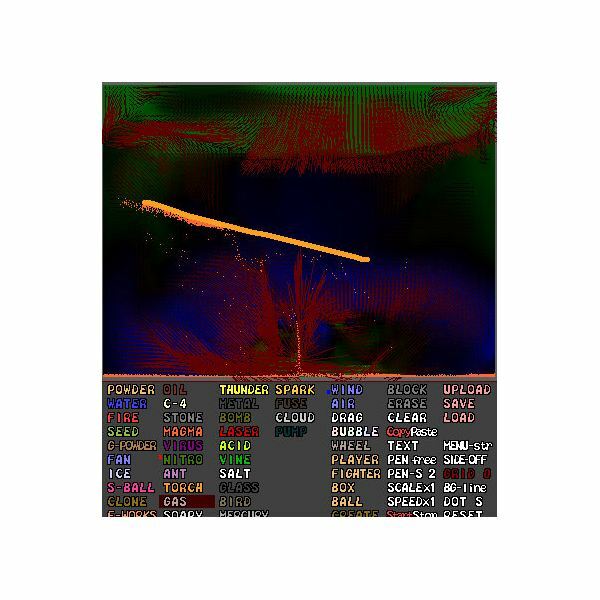 The game looks downright bizarre, and especially with the number of ways it provides to kill the depressed employee. The puzzles are quite innovative and get more difficult as you progress. The unusual concept of death makes this game more interesting and satisfying and the puzzles add some challenge to each level. All in all, Karoshi Suicide Salaryman has a unique concept and is a solid puzzler. This is one of the most unusual online games in this list. The objective is to keep your mouse cursor away from a tiny guy who tries every trick in the book to gobble up your cursor. 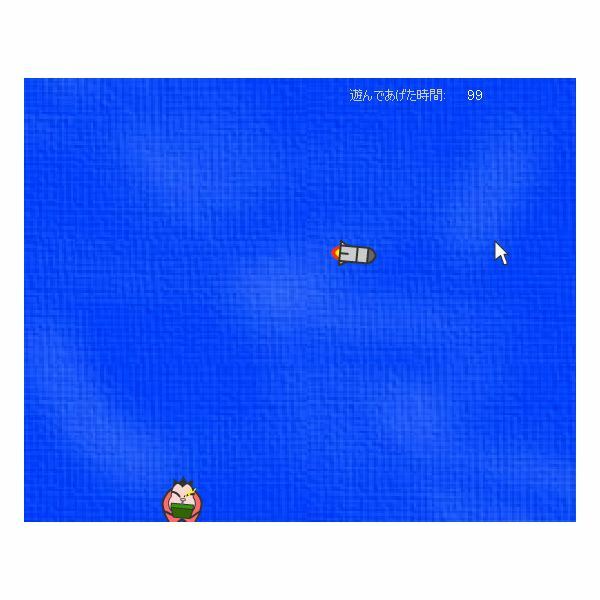 He will launch rockets, throw bombs and use huge poles to catch hold of your mouse cursor. He will jump from one corner to another and have an arsenal of weapons on disposal to eat your cursor up. Avoider is in Japanese and so non-Japanese players may not be able to understand the menu choices. All they have to do is click the first menu in the game start screen and move their mouse cursor to avoid getting it consumed by the tiny pink guy. This game and Karoshi Suicide are some of the most innovative games and both have been created by Japanese developers. All in all, Avoider is very addictive and is a must-play if you are looking for some weird games on the Internet. Developers lovingly call Atomz a “chain reaction game”. Going by the visuals, the game will remind you of your school’s boring chemistry chart. But trust me Atmoz is more unique and addictive than interactive chemistry lessons. The objective is to start a chain reaction by destroying as many molecules as possible. You will have to click on the screen filled with blue molecules. The red atoms, when in contact with the blue atoms in a molecule, start a chain reaction, consuming as many atoms as possible. Every level tasks players to split a set number of atoms. For example, to complete the first level, you will have to split at least one out of five blue molecules present. As you progress, the levels become tougher, allowing you to split more atoms. You score points based on how quickly you destroy them. Atomz unique gameplay-wise, in spite of plain visuals, and the sound effects are top-notch. Overall, this game is recommended for those who in search of free online unusual games on the Internet.